"This servant of God was Bishop of the country which the books call Thile, but which Northmen call Iceland. It must be said that this is an appropriate name for the Island, as there is plenty of ice both on land and on sea. On the sea there is sea ice, which fills up the northern harbors in great quantity, and on the high mountains of the country there are permanently frozen glaciers." "The inhabitants of Greenland of their own free will have abandoned the true faith ....and joined themselves with the folk of America." "...nearly 4000 people who 'entered the indrawing seas [beyond Greenland] who never returned." 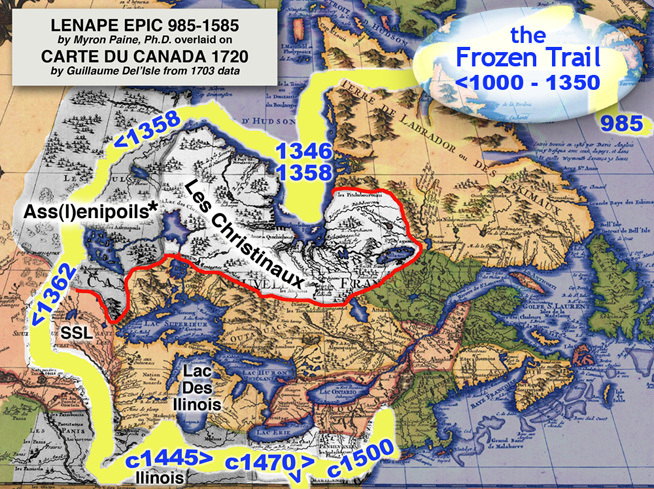 Did 'nearly 4,000' Greenlanders walk into Hudson Strait? Our school children do not learn about the LENAPE EPIC.